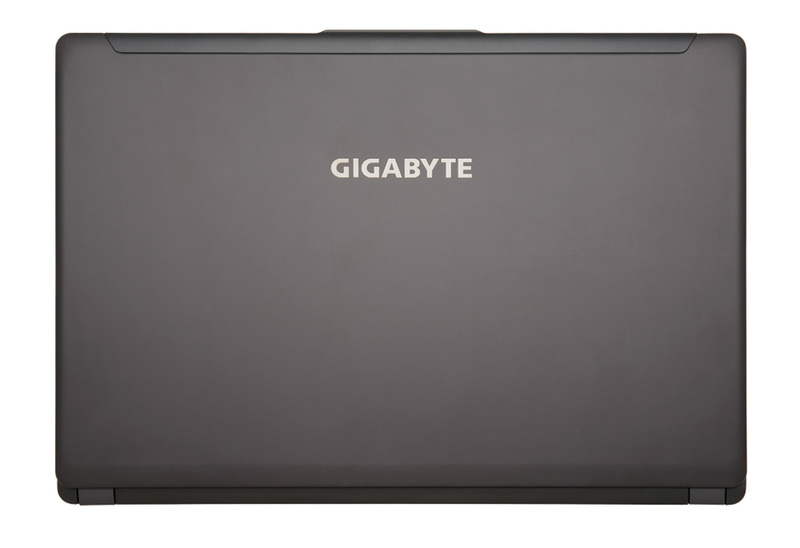 Last month we took a look at Gigabyte’s latest 14-inch gaming laptop, the Gigabyte P34W v3. Now, we’re back to look at its bigger brother, the 17-inch P37X. This gaming laptop is impressively equipped, with a 4th-gen Core i7 processor, 16GB of RAM and the best GPU available to gaming laptops: Nvidia’s GTX 980M with 8GB of GDDR5 memory. That kind of firepower should make for a top notch gaming laptop, so it’s remarkable to see that the chassis of the P37X measures just 22.5 millimetres. Let’s see how well it performs! Here are the specifications of our review unit. Various storage options are available, including an SSD of up to 512GB and a mechanical hard drive of up to 2TB. 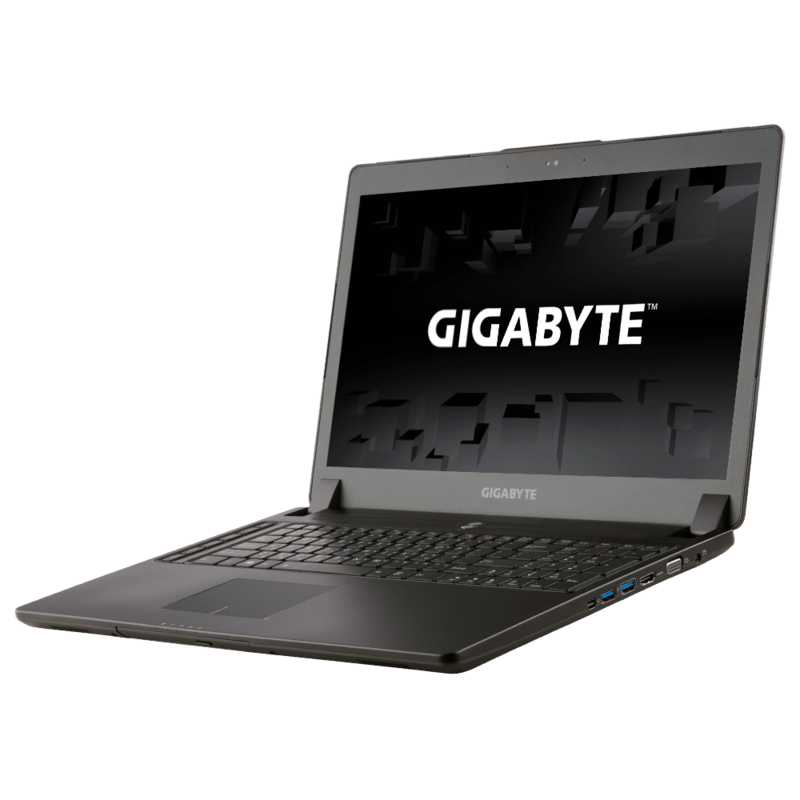 The Gigabyte P37X has a similar design to its smaller brother, with a combination of aluminium and plastic used in its construction. The lid is a good preview of the rest of the design: flat and smooth with gently rounded corners, and little ornamentation beyond an etched Gigabyte logo. Open up the laptop, and you’ll see the traditional arrangement of screen, keyboard and trackpad (this ain’t no Acer R7). The screen is 17.3 inches across the diagonal, and sits at 1920 x 1080. That’s reasonably sharp, and makes for a more achievable resolution target than 1440p or higher when playing games. The keyboard is fairly standard, with a near-full layout that nonetheless combines the main board and a numberpad into a conjoined arrangement. There are also six G macro keys on the left side. Backlighting is present behind each key, and can be set to three levels (off, bright, brightest). Above the keyboard we have a surprisingly spongey circular power button, wrapped with four speaker grilles. The trackpad is centred below the main section of the keyboard, as is customary, with no separated button area as we saw on the P34W V3. Multi-touch is supported, including edge gestures for Windows 8. There are quite a few ports on the laptop’s left and right sides. On the left we have a Kensington lock, ethernet, two USB 2.0 ports, an SD card reader, a 3.5mm headphone jack and a 3.5mm microphone jack. On the right, there’s the DC input, VGA, HDMI, two USB 3.0 ports and a mini DisplayPort. On the front of the laptop, we have some LED indicators and a DVD-RW drive (which can be swapped for a hard drive). The bottom has plenty of grilles and a few stickers, along with a panel for accessing the laptop’s hard drive. We used the Gigabyte P37X for work and play over a period of three weeks. Games played included Civilization V, Counter-Strike: Global Offensive and Deus Ex: Human Revolution. 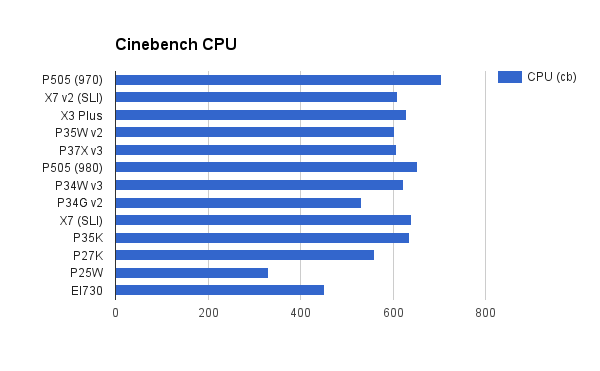 We also ran a series of benchmarks to get a quantitative feel of the laptop’s potency. The Gigabyte P37X is kind of amazing. You take it out, and it basically gets playable frame rates at 1080p resolution and high detail settings, no matter what game you try. Civilization, Counter-Strike and Deus Ex all ran smoothly throughout; this is one of the few laptops I actually felt confident playing ranked matches on. When it comes time to move on, the laptop’s light enough to not feel a massive burden. Of course, there are some downsides. Firstly, this thing gets loud as soon as you start a game, and the more you demand of it, the louder it gets. That means simple 2D titles are a noticeable hum, and the latest games ensure you have to really crank the internal speakers to actually hear what’s going on. Headphones are a must here. You’re going to be using a mouse for any serious PC gaming (or a controller), but you might also consider plugging in a keyboard. The laptop’s internal keyboard is incredibly shallow, making it hard to play RTS or MMO games that require a lot of keyboard work (FPS or MOBA titles, which use relatively fewer buttons, are okay). Otherwise though, the P37X achieves its goal of top-notch PC gaming. But how is it for all those boring non-gaming tasks? To keep this brief – the P37X is almost perfect for work. Its gaming specifications are overkill for most office applications, and creative apps like Photoshop and Premiere work great too (even if the CPU provided isn’t the very best available on a laptop). The dual solid state drives ensure Windows loads up quickly, and there’s not too much crapware to get rid of on your first boot. The only real issue here is the keyboard, which again has a tiny amount of travel and really feels bad to use. I actually wussed out of completing this review on the keyboard, and instead plugged in one of my faithful mechanicals. With a 17-inch chassis you’d think that there’d be room enough for a good keyboard, but sadly Gigabyte have chosen to neglect this area, and that hurts productivity. Now – how does the P37X compare to other laptops on the market, from Gigabyte and others? Let’s take a look. 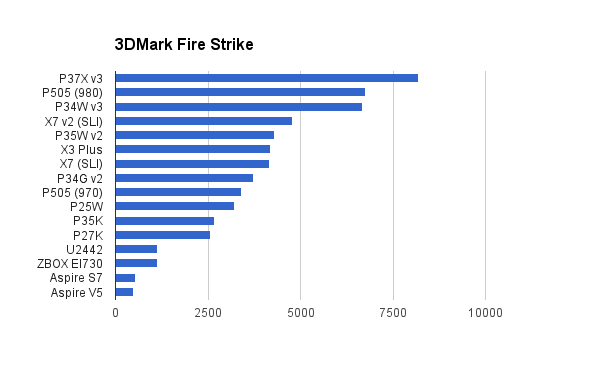 The P37X comes right out of the gate with a ridiculously high Fire Strike score, beating the XMG P505 by a massive 20%. What have Gigabyte built here? Either they’ve heavily optimised for this particular test (possible), or this is genuinely a beastly gaming PC (also possible). 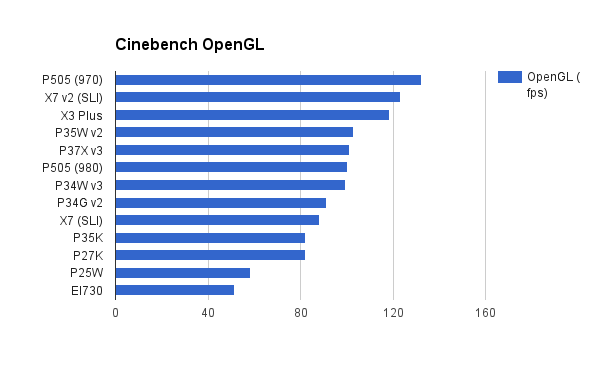 The Gigabyte P37X is decidely less impressive in the Cinebench test, showing reasonable but not chart-topping performance. Still, the test proves that both the CPU and graphics card are up to snuff. 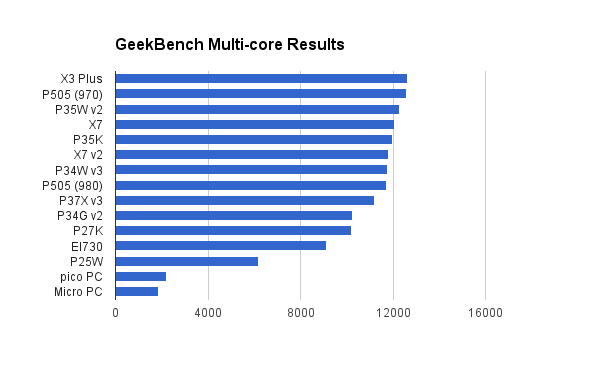 GeekBench is an excellent free benchmark for testing CPU performance, both for single-threaded and multi-threaded tasks. 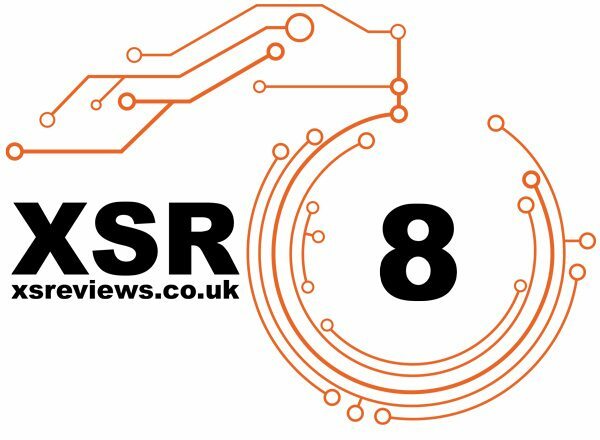 It’s a good way to see how well a given machine will perform on CPU-intensive tasks, which includes some games and creative endeavours (like rendering video, transcoding MP3s or brute-forcing an encrypted file). The Gigabyte P37X doesn’t come with a particularly tremendous processor, and that’s reflected in these tests, where the better-equipped X3 Plus and P505 hold a small but significant lead. If you’re looking for a laptop for processor-intensive tasks (such as rendering video or playing CPU-bound games), then other laptops might be more suitable for the money. 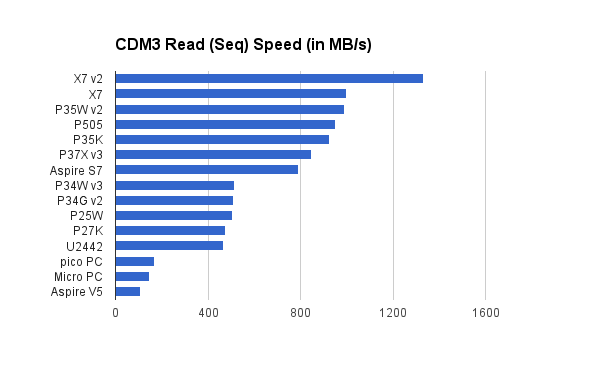 CrystalDiskMark is my favourite benchmark for testing drive speeds. 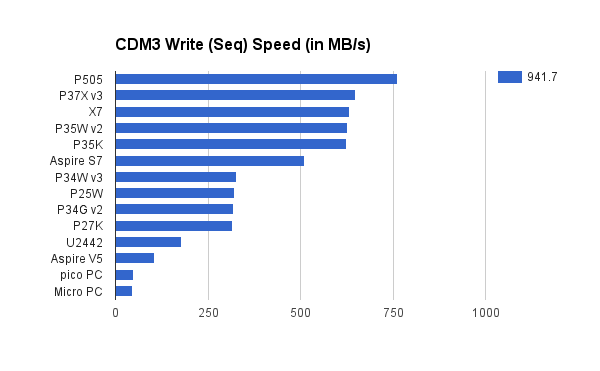 The dual SSD setup here produces some of the fastest speeds we’ve seen, with a solid 850MB/s read and 650 MB/s write. RAID0 provides no added reliability, but for gaming you can certainly use the extra speed. 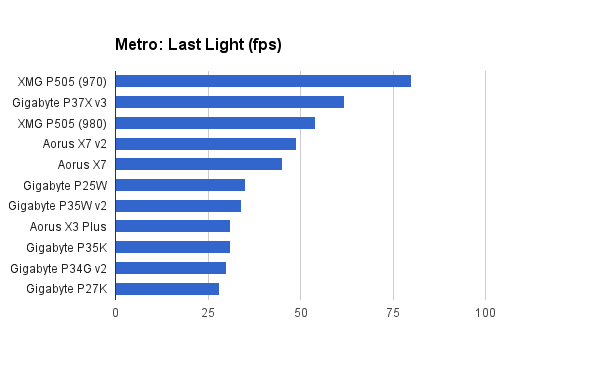 Metro: Last Light is almost a last-generation game at this stage, but is still provides a good challenge for both CPU and GPU at its highest settings. We’re running on the DirectX 11 version at 1080p, high settings, with AF 4x filtering, normal motion blur. We haven’t enabled SSAA, DirectX 11 tessellation or advanced PhysX. 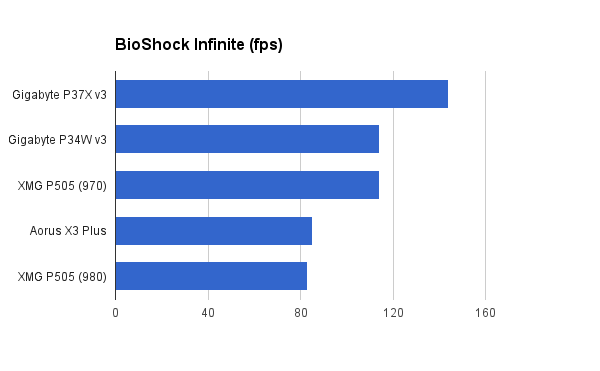 The results are pretty strong here, with the P37X v3 just barely trailing the titanic XMG P505 with a result of 54 fps. That’s highly playable, and a stronger result than any other Gigabyte laptop we’ve yet tested. BioShock Infinite is a well-crafted game in many ways, and that includes its benchmark. The game uses the popular Unreal engine, making it a good barometer for many other titles that use the same engine. The Gigabyte P37X shows that its earlier 3DMark result isn’t a fluke – this is a serious gaming machine for titles that stress the GPU over the CPU. The result of 144 fps is a good 30 fps higher than any we’ve seen before, and ensures buttery smooth performance at 1080p. 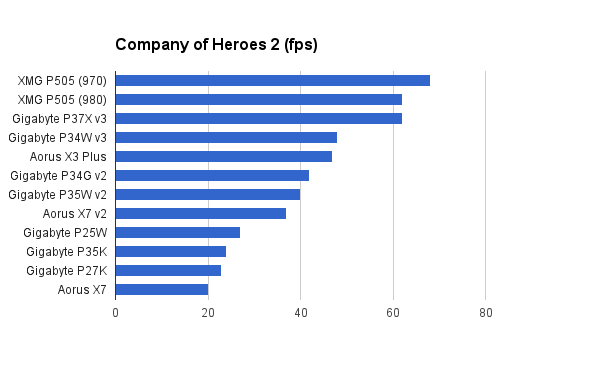 CoH 2 is an interesting title to benchmark because it is CPU-bound and only makes use of a single graphics card (no SLI support here!). The P37X records the highest result we’ve seen from a Gigabyte machine by a considerable margin at 62 fps. That’s an excellent result given the intensity of the benchmark. 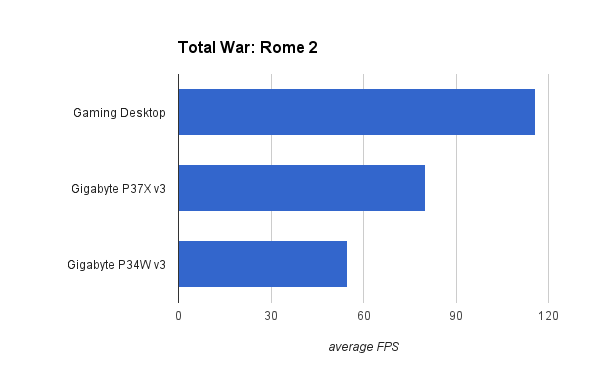 Our final game benchmark is Total War: Rome 2. As you can see, this is a new addition to our benchmark pool, with only a couple of results (and one of them is my gaming PC, which for the record has a Core i7 2600k processor and a GTX 980 GPU). The P37X comes neatly between its two competitors, scoring a highly playable 80 fps. Given that we’re operating at 1080p and Ultra settings, that’s quite remarkable, and really underscores the flexibility and strength of the laptop’s hardware. The Gigabyte P37X is an impressive laptop, packing a lot of gaming firepower into a very small space (for a 17-inch machine, at least). While there are some noticeable flaws – poor battery life, very loud fans and a crappy keyboard – these are acceptable given its focus. If you’re looking for a desktop replacement gaming PC that still fits in your bag, then the P37X is a fantastic choice.